This is the second in a three part series on the importance of recreational spaces in cities. These three short pieces about three different cities discuss the importance of play and relaxation spaces from three perspectives: first from the perspective of a father, then from the perspective of a mother, and finally, from the perspective of a grandmother. This piece was written by Ewa Rajchert-Linowski, Piotr Rajchert’s sister. The Waterfront Trail looking eastward at Humber Bay. Amos Waites Park, situated in the neigbourhood of Mimico in Toronto (Canada) is a “gem in the city” for me. The park is about a 10-minute drive from my family’s apartment or a 20-minute ride when we feel ambitious and bike down. I discovered this park during my maternity leave when walking along the Waterfront Trail. I love being down at the lake; where the water glistens, sailboats set off into the open water, cyclists breeze by, and people walk their dogs. Over the course of four years, Amos Waites Park and the surrounding area have changed tremendously. As a mother who lives nearby, many of these changes have been positive. The old metal swing and slide playground, has been replaced with two wooden pirate ships, climbing ropes, swings and a covered sandbox. This offers a safe place for my kids to play, far away from roads, and gives me a few moments of peace. During the summer months, children and parents can cool off at the pool, which is free for Toronto residents, and a soon to open splash pad (Summer 2017). 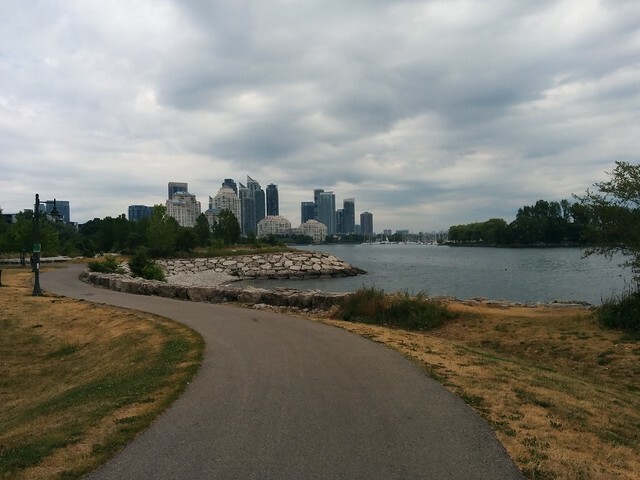 Additionally, the Waterfront Trail at this section has been connected to run directly along Lake Ontario, instead of detouring along Lake Shore Boulevard West. It thus avoids vehicular traffic. The new trail also offers a separate pedestrian boardwalk, which keeps bikes out by the use of speed bumps at either end. Maybe this feature matters less to everyone else, but for a parent, it is hugely important. This separate path lets me and other parents breathe easy and not continuously check if we are in a cyclist’s way. The boardwalk is out on the water, such that you can observe wildlife including ducks, sea gulls, fish, and more on either side of you. We even saw an otter recently.